Believe it or not, every type of pomade will work to a different extent for every type of hair. If you find you have very thick hair, you’ve likely noticed that most pomade on the market seems to have been made for the lowest common denominator – those with hair of an average thickness. And why wouldn’t this be the case? More customers equal more profit. As you’ll see in the following review and buyer’s guide; however, finding the right pomade for thick hair is easy once you know where to look and what to look for. By the time you’re done reading this review, you should know exactly what your hair needs, making finding the right pomade a piece of cake. No matter how thick your hair is, you’ll find each of the above pomades does an excellent job of doing exactly what it is you want them to do – tame your thick main. However, each one comes with a few subtle differences that actually make each one’s application process quite unique from one another. Although it may have a bit of a learning curve at first, you’ll find it to be the most rewarding in the end. This is not only due to it being more effective on a gram-by-gram basis (which, in turn, makes it a more frugal option), but the high amount of control it offers, allowing you to customize your pomade experience as you see fit. There’s no question that the Star Pro Line Premium Pomade is the best pomade for thick hair. After multiple tests this pomade came out on top as it has the best hold and it lasts all day. It comes in a 5 oz container and it’s paraben and formaldehyde-free. This professional grade pomade will keep your hair in place. It goes on a lot thicker than any of the other products we tried and has a nice matte finish. It’s easy to wash and rinse and smells great. Out of the entire Star Pro Line, this pomade has the highest degree of hold. It’s excellent for thick and unruly hair. It applies nicely and it’s easy to rinse off your hands when finished. Customers love the Premium Pomade because its superior hold, matte finish and excellent smell. If you want a pomade that simply works give the Premium Pomade form Star Pro Line a try. Here’s a pic of a Mohawk right after applying the pomade. The Uppercut Deluxe Pomade is made for thick hair; there’s no question about that. However, what makes it interesting is that this can be a great household pomade for homes featuring many different folks, each with their own level of hair thickness. This is achieved through going against the traditional formula that we often see in pomades made specifically for those with thick hair. We’ll get more into the formula in question in the buyer’s guide below, though I’ll say that this makes it a more versatile product, no matter the thickness of your hair. Outside of its ability to tackle a wide variety of hair types, it also stacks up well when measured by all of the standard metrics of quality. For example, it has a nice smell about it. Its vanilla-coconut scent isn’t only pleasing; it offers just the perfect level of scent strength. 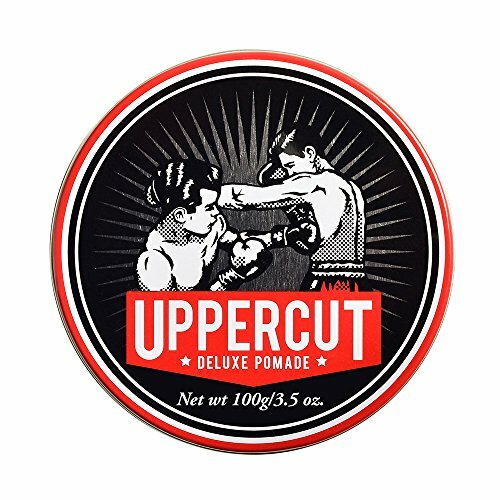 While many hair products – pomade or otherwise – tend to give off a very strong scent which forces you to pair your body fragrance accordingly, this is not so much the case with the Uppercut Deluxe Pomade. Simply put, any fragrance you may happen to use will still be the focal point of your smell profile. The only time this smell will truly become noticeable to others is in the absence of any other fragrances which may happen to be used. This is a huge plus which makes things a whole lot easier. 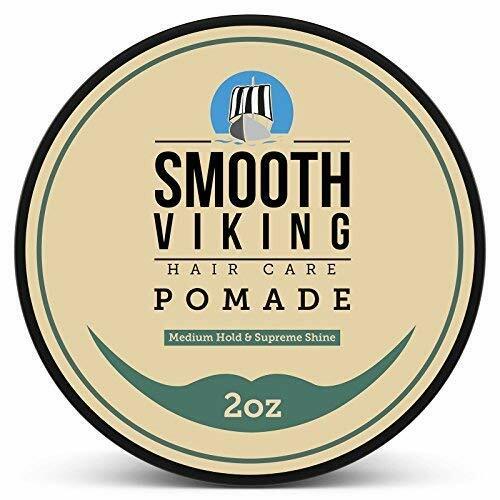 Unlike the product we just covered above, which follows an unconventional formula to cater to those with thick hair, the Smooth Viking Strong Hold takes a more conventional approach. In fact, despite the product’s name, you’ll find that it is no stronger than any other pomade on a gram-by-gram basis. However, because the pomade in question is water-based and is (somewhat) thin, you’ll find that you can fit more of it in your hair in the first place. While this may sound wasteful if you’ve never used such a pomade, the fact of the matter is that this is simply the best way to tackle thicker hair. While thicker, stronger pomades tend to be the more frugal option (being that you can use less of them to achieve the same effect), applying the product with a great level of consistency takes a bit of extra time to master. With the Smooth Viking Strong Hold; however, you’ll find covering each and every last hair on your head to be a very easy ordeal. When the learning curve of heavier pomades just seems like more of a hassle than anything, the Smooth Viking Strong Hold is a great choice due to it being thinner than average while still maintaining an average hold. We’ll get more into pomade thicknesses briefly. I mentioned that even though the above product has a great overall hold, this is not so much the case on a gram-by-gram basis. This is because it has been made in a way that lets you apply more pomade at once. 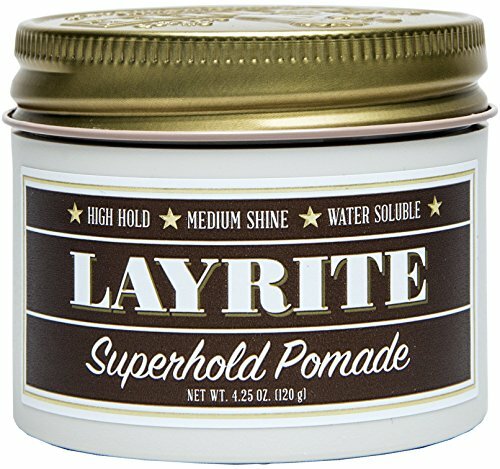 The Layrite Super Hold Pomade; however, goes against this pomade-making strategy. If the Smooth Viking is on the thinner end of the spectrum, the Layrite Super Hold Pomade is on the thicker end of the spectrum. 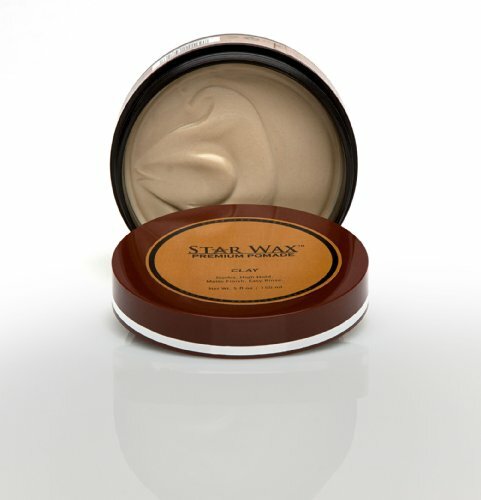 In fact, you may very well find this particular product the be the most “waxy” pomade you’ve ever come in contact with. As such, you’ll find it takes a bit of time to properly learn to consistently spread it throughout your hair. However, this will save money and give you a higher sense of control in the long run, making it the best choice if you don’t mind tackling its initial learning curve. For example, the Uppercut Deluxe is an absolute must if you know you’re not the only one using the pomade. Although it does an excellent job of handling thick hair, you’ll find it does a great job of handling all hair. This makes it great if you’re living with others and don’t feel like buying multiple products. On the other hand, the Smooth Viking is excellent if you value a high ease of use. This is because it does the exact some job every time. However, due to it being extremely consistent in this sense, you may be sacrificing some degree of control when using it. For something on the opposite side of the spectrum, look no further than the Layrite. What is a Pomade for Thick Hair? You may have noticed a recurring theme in the above reviews – thickness and consistency. These are the most important factors to consider when looking for a new pomade, though many folks may have no idea of the difference between thick and thin pomades. If I’ve lost you, let me further explain so you may know which type of pomade is right for you. Do you need a thick pomade? Upon first glance, a thicker pomade may resemble that of a very waxy substance. Of course, this gives it a great hold. One gram of thick pomade will have much more hold than one gram of another pomade. Of course, this translates over well to thick hair. Thicker pomades come with their own list of advantages which are most apparent when used on thicker heads of hair. For example, thick pomade tends to be very frugal. Because of its sheer amount of hold, it makes sense that you wouldn’t need apply as much of it to get a great effect. Of course, we can all appreciate a bit of frugality in any product. It also gives you more control over how much you put in your hair and to what ratio it is applied (more in the front, less in the back, etc.). This makes it great if you don’t mind taking the time to get just the look you’re after. Do you need a thin pomade? As great as the above sounds, thinner pomades also come with a few benefits. In contrast to those of the thicker variety, thin pomades may more closely resemble a gel than a wax. As such, you’ll find them much easier to work with. Think of the difference between cold butter and melted butter; with thin pomade being the melted butter. On the other hand, you’ll find you have less control over the ratio at which your pomade is applied throughout your hair. In short, this means that the effect you get from your pomade will always be consistent. While you have less say in the final result, you’re also much less likely to encounter any issues due to the presence of human error. In short, you’re guaranteed a satisfactory head of hair, but never an amazing or lackluster head of hair. Consistency is what thin pomades are all about. Unlike thicker pomades; however, thin pomades aren’t always the most frugal solution. This is because they just don’t have as much hold. One gram of thin pomade won’t be nearly as effective as one gram of thick pomade. Of course, this is compensated by the fact that thinner products can be more abundantly applied to the hair. It is this particular characteristic that makes said products so easy to use in the first place. From your wallet’s perspective; however, this isn’t the greatest characteristic. In the end, it’s up to you to decide whether or not ease of use is higher on your list of priorities than frugality. There are two main types of pomade – water-based and oil-based. Let’s take a look at how either type varies from the other, ensuring you know just what you need in your next product. Oil-Based Pomade – The “original” pomade, if you will. Oil-based pomades, believe it or not, actually have less manmade chemicals in them. While the chemicals in water-based pomades haven’t exactly been shown to be detrimental to your health, oil-based products are better if you’re the type to prefer products of a more natural nature. These pomades give you more control throughout the day due to their greasy nature. After applying it, you’ll be able to constantly fidget around with it throughout the day, allowing you to quickly fix your hair whenever a mirror may be present. Water-Based Pomades – Because these pomades have less of a grease factor about them, you’ll find that they “lock in” your look more so than their oil-based counterparts. This means that your hair has less of a chance of getting messed up after you apply the pomade in question. In the event that your hair does get messed up; however, you’ll find it much harder to fix. This is because water-based pomade dries more readily. If you’re confident that your hair won’t get messed up, such pomade is your best choice. If you’re the type to constantly fidget with your hair in front of mirrors; however, you may find it leaves you rather limited. While the usefulness of any of the pomade features we’ve covered thus far is based entirely on subjectivity, there are a few features you should always look for in pomade made for thick hair. Keep an eye out for the following characteristics in any pomade you purchase. A Great Hold – Now, whether you choose to go with a thick or thin pomade will change the amount of hold you can expect. However, it always helps to find a product whose hold is great relative to its overall thickness. The Smooth Viking we covered earlier is a good example of a pomade whose hold is quite large relative to its thickness. A Great Shine – If you didn’t want any shine, you would have used gel instead. Even water-based pomades can and should have a great shine about them. No matter the thickness of your hair or the thickness of the pomade itself, a product’s shine is a great representation of its overall quality. There are two very big factors to consider when picking out a pomade – its level of thickness and its base ingredient. Thick, thin, water-based and oil-based pomades all have their own merits and drawbacks. Of course, by picking out the right pomade for you, you can be sure you’ll get all pros and no cons. Keep all of the above considerations in mind when shopping for hair products and you’re sure to have the sleekest head of hair on the block.